With so many apps taking notes available, it could at times becomes difficult to decide which one is the most adaptable to your style or the required tasks it would have to able to perform. With variety available there are an abundance of different apps for any purposes users can think of or even for purposes not thought off before, and mobile users can be sure to find you specific to their needs or the very best one to be adapted to it. Here are some of the very, android best note taking apps currently available. Squid is referred to as the best for creativity and enables users to get creative with their notes. For those who like to doodle or consider themselves a bit of a calligrapher even if you are just nostalgic about paper notes, then the Squid app is most certainly the one for you. Squid is perfect for scholars, professionals and students and is uncomplicated to use and allows anyone to add quick notes. Keywords or definitions in text or handwritten are excellent for studying or getting ideas for a term paper but to enjoy its full functionality it is necessary to upgrade to use this feature. It works well on a phone but is ideal for tablet use. The reasons are more space enables you to draw more and it works great with a stylus. A combination of creativity and note taking. 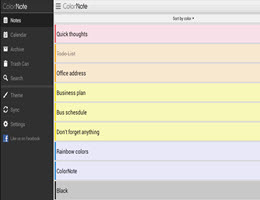 Color Note has fewer features than the other apps here, but is also the simplest. It’s best suitable for users who are looking for something that is easy to use, fast to call up and super-fast to store in a save place protected by a personalized security code. This option can be used on any smartphone by text or stylist. Simplenote, is an app that is super lightweight, both in terms of resources and size since it uses only 4.5 MB. Users simply type in any notes, to add tags is uncomplicated and notes can be shared. It is possible to create a Simplenote account. Wit an email address and password users will be able to back up work across different devices.